Prince of Thorns! My wife spent a lot of time scouring the interwebs for new books and authors for me (I am a lucky woman!) and stumbled across a LOT of love for this crazy little antihero, so when she ordered a new load of books for my birthday all those years ago, Prince of Thorns was among them! 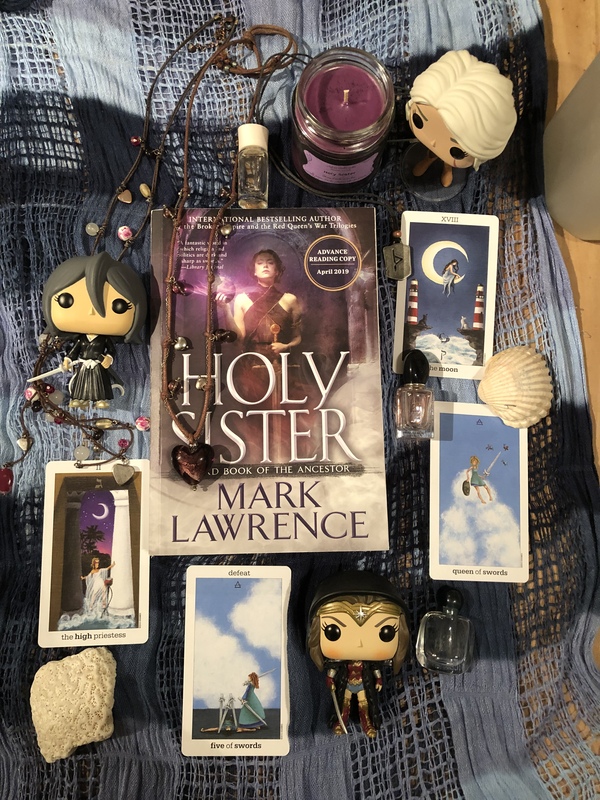 Red Sister holds a VERY special place in my heart because while I love Jorgy and his supporting cast, I really connected on a personal level with so many of the characters in this one! The casual LGBT representation made me so excited as well, because it’s so freaking rare to find good representation in ANYTHING, let alone work from someone I already love for completely separate reasons!! ADOMA. I had a dream that The Girl and the Star was about Adoma, and it got me SO excited. For some reason, I’m really drawn to this mysterious woman, and I’d love to learn where she came from and what she wants to do with herself. I can’t wait to hear more about her in Holy Sister! I picked up Prince of Thorns from the library because the cover looked cool and I didn’t have anything to read. Then I started reading and didn’t stop. I read all night and finished it. Then I went back for the others. Thats when I knew I had to get my hands on all of them. I had to OWN them and not give them back after I read them. That’s where my love affair started. The books are a bit expensive in my country and I wasn’t making a lot of money back then but I helped a doctor pass his IELTS exam and he was so grateful he gave me a book voucher and I went straight to the bookshop and bought all 3 books in the Jorg series. I also lent them to my best friend so he could read them as well. I think my favorite book is Red Sister. It speaks to me somehow. I love the fact that Nona is a small and not very significant person but she’s still the hero of the story. Despite the bits I have to skip, I couldn’t read the bit about the donkey, too sad, I really enjoyed the story. The writing was interesting and engaging and though Mark is a man writing in the perspective of a woman, he doesn’t make it sound weird or uncomfortable. It’s perfectly natural and I enjoyed it immensely. As for the character I’d read more about, I’d pick Prince Jalan. He started off really whiny and selfish but then he really grew on me and I’d like to know more about him and his story. What happened after he won? I was standing in a bookstore in the fantasy section and ended up talking to a young man about half my age. He commented on the books I was selecting, and he thumbed through your section until he found the Prince of Thorns books. “If you want to read something that will knock all of your beliefs about fantasy out of your head, read this”. I bought it, and I’ll admit I was not sure. Grimdark was not my thing at the time. But I can honestly say that reading your books has encouraged me to move far beyond my typical reading. Right now, vampire romance that is called fantasy. Yea………right. This is what I am reduced to as I wait for another of your books. As to favorites, Red Sister, by far. My vote for best book I read all year. Prince of Thorns was the first book by Mark Lawrence I ever read. I blind bought it because of reviews I had read talking about the questionabilty of the protaganist’s moral center. As a life long fantasy reader, I’d been growing tired of the “good vs. evil” tropes of so many fantasy series. Even ASoIaF has begun to fall into regular fantasy trappings. The Broken Empire was such a breathe of fresh air. All I could think reading it was, this is what ASoIaF should’ve been. I started with Prince of Thorns – got it after I’d binge-read all of Robin Hobb’s back catalogue and was getting fantasy withdrawal. She recommended Mark’s books on her Twitter feed so I thought I’d give one a try, so glad I did! There were 3 reasons i bought Prince of Thorns. The first reason was the artwork of the cover. I dont know who made it though. The second reason was that it was highly rated by Conn Iggulden who i am a huge fan of. And lastly was that it was in the Grimdark genre which i also love and Mark Lawrence really captured the gritty and dark setting of a medieval world. My favourite book by Mark Lawrence is King of Thorns mainly for the reasons previously mentioned but it also kept me glued to the pages from start to finish and i think it also captures Jorg’s more gentle side. The character i would like to see more of is Keot in Grey Sister. He is like a spoilt homicidal and largely insane child who was thoroughly entertaining. Prince of Thorns was the first book I read. I had added it to my amazon cart to hit the one day delivery minimum. I was hooked from the first page and in the last week of 2017 through end of Jan 2018, I read everything Mark had released! At least I didn’t have to wait long for Grey Sister when I was done! 1. Prince of Thorns was my first book, I read this article on Tor.com titled, Five books about deeply-flawed despicable people. Prince of Thorns was the one that caught my eye. 2. My favorite book is King of Thorns, because of the mountain motif, if that’s the right word. It was extremely inspiring, and was written extremely well. Also seeing Jorg overcome the impossible odds against him was great. 3. I would love to read a short story about Snorri. He’s my favorite character Mark has written. I couldn’t say a certain book as I loved them all. Jorg ranks highest, followed closely by Nona, and then Jalan. So many epic parts but Jorg’s Bad assery does it for me. From eating the heart to destroying a kingdom to defeating all on the battlefield. While he is far from a perfect person (the killings) I can’t help but love him. So glad I did, of course–I absolutely love that trilogy and I am really enjoying Nona’s story too! I first read Blood of the Red, though in its original version, because Mark made it available on an internet group. My favourite book is Red Sister. I love the world concept, the characters are really interesting, I like more than one character perspective and it is the right level of grim-ness. I first heard of Prince of Thornes via amazon. I had just devoured that Game of Thrones guy’s books and was looking for another saga to feast on, amazon recommended the thorns trilogy and I ordered them…..there they sat, three glistening pristine paperbacks slowly accumulating a thin shimmer of dust. I have since advanced to audiobooks as well, delighting in the acting talents of the voice actress portraying all the characters in the sister trilogy. I must confess that having nieces who are rapidly learning to retort with knife like tongues and are proving their sharpness of wit far outshines my own has endeared me towards Nona and her tales. I would like to read more about a young Abbess Glass, how she rose through the ranks, dealing with loss, outwitting those around her, how she came to play the game so well and who taught her to play…. and win. Love your words Mark. Bring us more worlds.